There’s not been a lot of time for two or three-wheeled ambling recently. Instead, a pretty solid wall of work-borne rush, stress and frustration has kept me off the bikes. So, with an unaccustomed free Sunday afternoon and some sun, I decided to stop beating my head against it, hoiked the keys off the peg and helmeted up. The saddle of a motorcycle is not generally a place for wool-gathering. 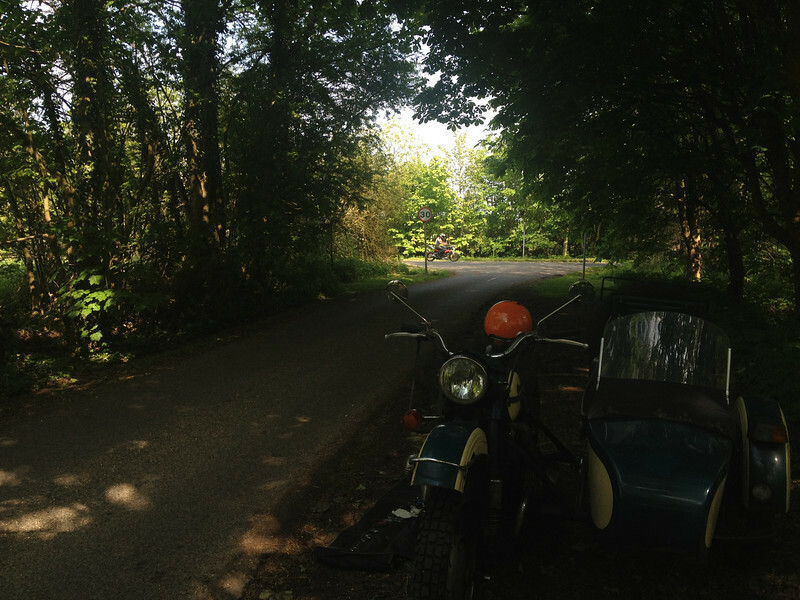 Back lanes with no traffic and the Ural are fine though. And soon, like most riders, in time with the clacking of the engine, I found myself humming contentedly. All sorts of tunes seem to push themselves forwards as candidates when you’re on a bike. There’s no knowing whether it’s going to be Bach or Bragg. Today, it was Flanders and Swann’s Slow Train. Fitting, with the 50th anniversary of Dr Beeching’s “The Reshaping of British Railways”. No churns, no porter, no cat on a seat. As I turned past Clanfield’s Plough, I got a nod and a smile from an old gentleman kneeling to tend the war memorial. He was trimming already immaculate grass. Making sure that the edges by the white limestone kerbs were neat, regimental and correct. I stopped just outside the village, climbed out of the saddle and rolled out the tool kit. As I snugged down the brake arm adjuster to take the slack out of the linkage, something red, noisy and two-wheeled screamed past, it’s rider’s wide eyes fixed on the next apex. Slow Train seemed even more suitable. Here he is – you can just about catch him by the ever-present Oxfordshire 30mph sign. I don’t ride a bike to go fast. It’s partly lack of desire, but mostly lack of ability. I have the cornering skill of a novice yak on stilts. I brake for corners on motorways at double-figure speeds. I sometimes wonder if riding the Ural isn’t just a substitute for having stablisers. But Slow Train it was, and I bimbled on smiling, brakes adjusted. 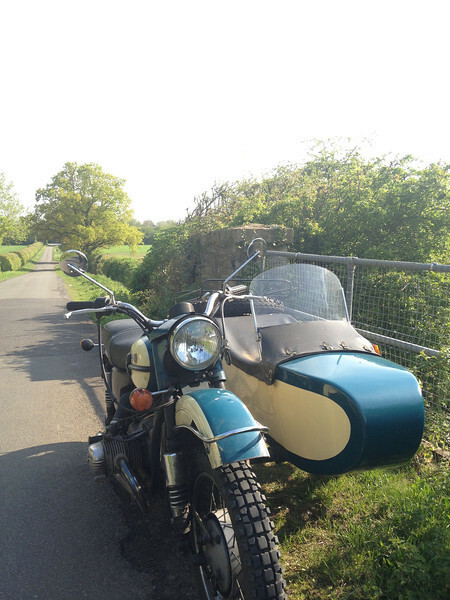 There’s a tiny, barely sidecar-wide lane that leads out of Clanfield. The flatness of the Oxfordshire countryside is only broken by the gentle rise of bridges, spanning the now disused Fairford branch line. No whitewashed pebbles, no up and no down. I stopped at the base of the first bridge and climbed off for a look around. From the top, you can still see the line of the tracks, even if the metal has long gone. The GWR brickwork is still in fine order. 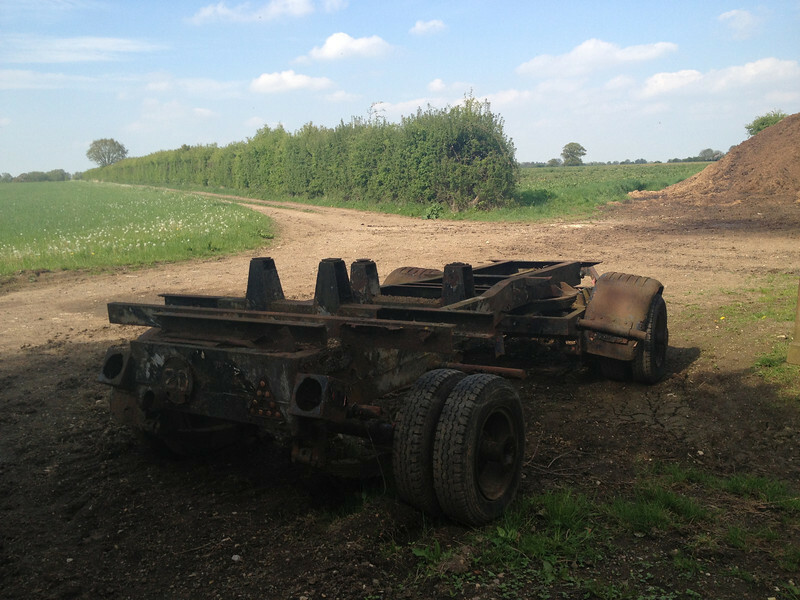 The wreck of some sort of old flatbed trailer looks as though it hasn’t moved since the 1960s. The railway is closed now, though, with a firm “Private – No right of way” notice in case you stray. Even given my congenital lack of respect for rules and bossy little notices, I stayed out and rode on. I followed the old trackbed through the lanes, crossing and re-crossing on similar redbrick bridges. The gentle rise and fall of each edged with spring leaves – that fresh green that only May brings. Eventually, I reached Lechlade. I’d hope to find coffee, maybe a cake or two. 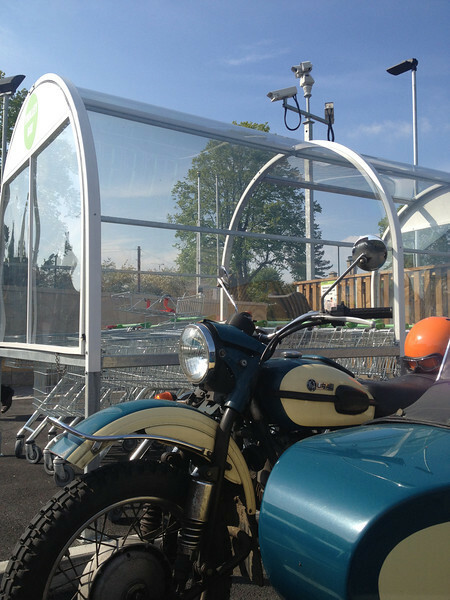 But Lechlade was mostly shut apart from a gleaming new Co-Op petrol station supermarket. I can’t say the architecture, or the bank of CCTV cameras that would have pleased the Cold War Kremlin, appealed. As the single, dead eye swivelled to scrutinise me, I wonder what trouble they were expecting in Lechlade-on-Thames. I stopped to ask if anyone knew where the old station was. The staff seemed surprised that there had even been a station, but a man in the queue spoke up. “It was just up the road by the bridge. Can’t see much now. You’ll see even less in a couple of months – going to be a housing estate.” I won’t be going again on the slow train. I thanked him, and passed on the machine-dispensed ersatz Costa coffee with its blinking digital readout as I walked back to the carpark and the bike. The man from the queue followed me out and we talked for a while in the sun about Beeching and the anniversary of his report that was a death sentence to so many rural lines. The chap was planning a website of photographs showing what the old station sites looked today. Enthusiasm for the railways clearly still burned. I rode on to see what I could find of the old station at the end of the line, Fairford. Another planning notice promising “executive apartments” and an industrial estate was all that stood there now. As wonderful as trains and steam would have been, time has lent a rather rosy romance to the old branch lines that I’m not sure they wholly deserved. Looking at satellite maps, you can still follow the Witney-Fairford line still clear and arrow-straight. It runs across newly-ploughed fields and joins the dots of housing and industrial estates from Fairford to Witney. It doesn’t seem likely it’ll be forgotten soon. I turned the petrol tap back on, kicked the bike into life and retraced my meandering, lane-bound tracks. As I pulled up outside the cottage with the bike ticking and cooling, I could just hear an accordion and fiddle weaving their way through The Fool’s Jig. It’s nearly Whitsun, so the village’s Morris sides are practicing in various pub gardens. It seems a pleasant sort of practice, usually involving beer, plenty of joshing and some serious dancing. Bampton station and its line may be long gone, but some older traditions are very much alive. No-one departs, no-one arrives, from Selby to Goole, from St. Erth to St. Ives. They all passed out of our lives, on the slow train. → Episode 1 – Living on the plastic – for a month. 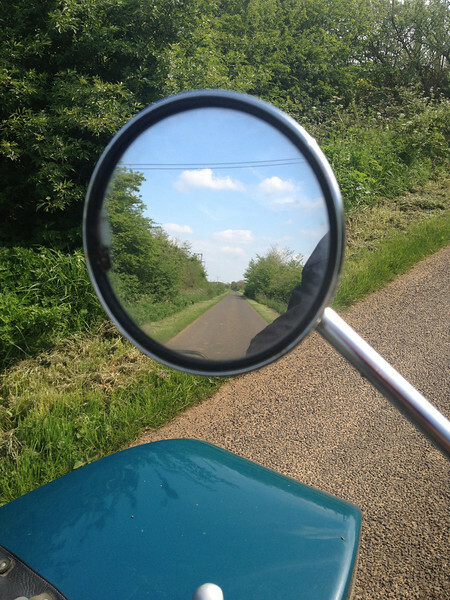 As ever MMC, your musings evoke a wonderful connection to what it is to live in the English countryside – made even more powerful by my being familiar with where you’re riding. As I allow myself to sink into the picture you paint, your words bring a warmth and deeper appreciation of what’s right on our doorstep. Thank you! Thank you, Peter. One of the reasons I started blogging is because I believe (cheesy as it sounds) that there are adventures, characters and so much beauty in normal, everyday things. The trick is in seeing them. I can only echo Peter Docker’s remarks. Having spent a lifetime on two wheels and half of it professionally, my current status of ‘no running bike’ leaves me with a certain emptiness. This has to be remedied, and living amongst the Shropshire Hills – needs to be remedied. Such wonderful lanes to explore. Thanks for the added impetus. Derek, thank you – as ever. You clearly need a bike though. Bikes are why God invented Shropshire. As an rural Oxfordian native, and a huge fan of that Flanders and Swann tune, this is a great little piece of writing. Thank you Jack – I really appreciate that. Interesting musings. regarding ‘Slow Train’, some of those stations were not swept away in the ’60s; Chester-Le-Street is on the East Coast Main Line and serves many trains a day, perhaps even a few of the sleek electric expresses that usually whoosh through between Kings Cross and Edinburgh. And even the St Erth to St Ives branch lives on. Perhaps the real villain was Ernest Marples, a motorway contractor who was also Minister of Transport? He employed Beeching as his hatchet man, and claimed he had no vested interest in shutting down railways while building motorways as he had transferred his Marples Ridgeway road construction company shares to his wife! But maybe even Marples wasn’t the real villain. Perhaps it was good old British Rail themselves? Many of Beeching’s recommendations (and that’s all they were) made sense; hopelessly uneconomic branch lines mostly. British Rail, however closed some really useful routes such as the Midland main line through the Peak, a mere few miles between Buxton and Derby line that cut off the south easterly approach to to the North West. The Woodhead Manchester – Sheffield route; has any other country closed a busy electrified main line between two major cities? 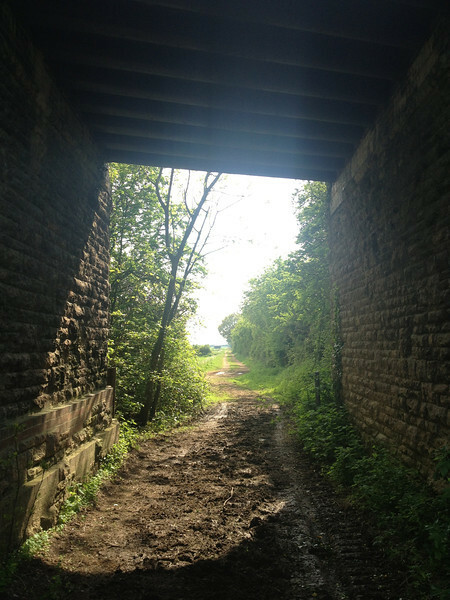 There are many other examples of useful railway infrastructure which was not on Beeching’s list being closed post-Beeching by BR. BR even tried to close the now heavily used and highly scenic Settle Carlisle line by lying about the state of Ribblehead Viaduct as justification. They also singled many busy routes, took out signalling, and simplified junctions. Most of this latter damage has been or is being restored by today’s busy railway because we are desperately short of capacity, but it should never have happened had BR been better custodians of our railway system. Beeching makes a great scapegoat, though! Nice blog. 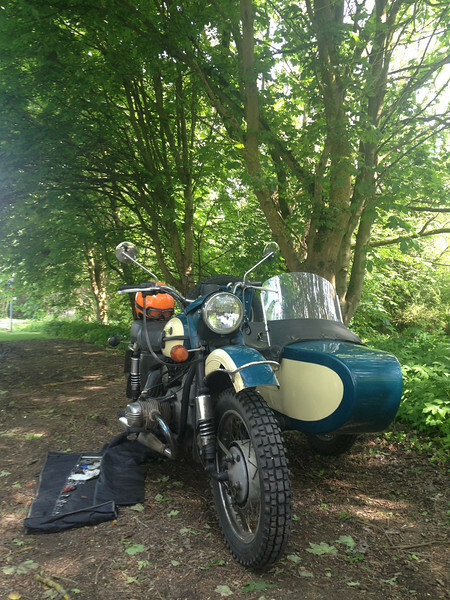 My equivalent to your Ural for rural bimbling is a lovely little Honda C90, while two ‘big bikes’ also occupy my garage. My blog is at http://vinchad.blogspot.co.uk/. Thanks Vince – really appreciated that. Always fancied a C90 too… I’ll go and take a look at your blog!